California is multi-cultural society and therefore taste buds are filling with different mouth watering dishes. Santa Barbara is one of the best places on west coast, where Ocean meets Mountains and sun meets sand. Krishan Gupta(Owner of India House) is one of those who have won millions of heart by cooking. Now he brings world-class culinary experience from Copenhagen, Lund, London, Paris ,Munich, Berlin, New York , New Jersey to Santa Barbara, California. 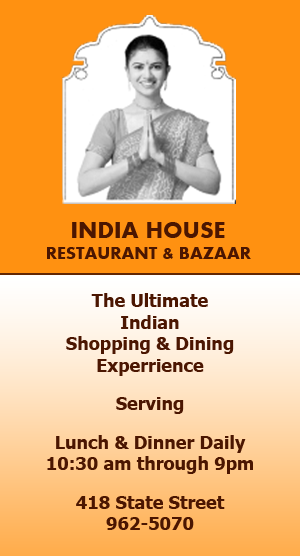 India House , opened in 2000 selling India items and restaurant decorative items in California. Krishan's memories of his grand-mom tasty meals and his international Culinary experience have always been his passion to make friends with traditional flavors the way to enjoy real authentic Indian Cuisine. Krishan's mixing of spices and knowledge of Indian food is not only the taste but also the surrounding and the atmosphere in which you enjoy and feel yourself in Seven Heaven.